With Fall rolling through with the subtleness of a monster truck here in Calgary, my wardrobe has been caught off guard in a big way. It is impossible to switch my entire wardrobe to Fall in such a a short period of time, especially when I have summer dresses, like this ASOS Curve shirtdress that got close to no wear this past season, that I cannot bring myself to let go off just yet! I decided to dig through my wardrobe and create a Fall ready look from a summer dress. I used five key Fall essentials to transform the dress into a look that would help me stay warm long enough to bring my wardrobe up to full Fall status. 1. The turtle neck - turtlenecks are making a hug comeback this season, and I couldn't be more thrilled about it. It is the perfect fall piece and should, rightfully so, be a staple in our wardrobes as the colder months roll through. I have gathered turtlenecks in a variety of colours and forms (e.g. sweaters, crop tops, t-shits etc.) that will help me create looks that are both cute and practical when it comes to the cool Fall weather. Shop some of my Fall turtle neck picks here, here & here! 2. The shawl - shawls and overgrown scarves scream warm and cozy. Theres nothing better than wrapping yourself in a wool shawl while also keeping your inner fashionista alive. A shawl or blanket scarf can easily be thrown on top of an outfit as either a make shift poncho or wrapped around your neck helping you get through the cold winds. Shop some of my Fall shawl picks here, here & here! 3. The belt - I am a sucker when it comes to a good belt, irregardless of the season. A good belt comes in so handy, creating faux waists and structure in pieces that do not originally have one. The original denim t-shirt dress that I used as a base for this look is cut to be t-shirt like and therefore didn't have a defined waist. 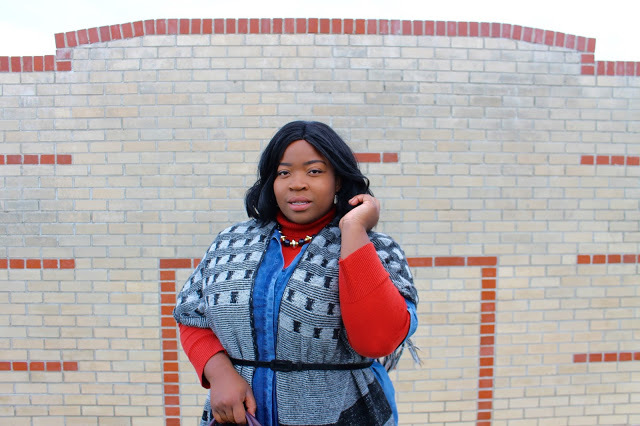 By throwing on a skinny belt, I both created a waist while also keeping the shawl tied down. Shop some of my Fall belt picks here, here & here! 4. The bootie - I am all about the bootie, let's be real. When you don't want to deal with knee high boots but still want to keep your feet warm, booties are your answer! Not only are they a huge, re-occurring Fall trend, but they are practical as well. I opted for a cowgirl inspired tan bootie, but there is such a wide variety when it comes to choosing a bootie option that the outfit combinations are limitless! Shop some of my Fall bootie picks here, here & here! 5. The structured bag - a good bag makes an outfit, there is no confusion there. Finding the perfect purse really helps to bring together an entire look. For the Fall season, structured shoulder bags and totes in rich gem colours are here to stay. I decided to bring out one of my faves from the spring season, as its rich plum colour helps to bring out the orange of the turtle neck I paired it with. Shop some of my structured bag picks here, here & here!